Dr. Kim Ki-Ryung, president of Mercer Human Resource Consulting, Korea, poses for camera in his office. 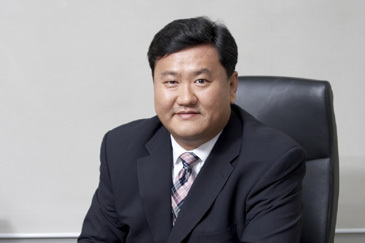 Dr. Kim Ki-Ryung of Mercer Human Resource Consulting will speak at ANZCCK Breakfast Forum. ANZCCK Chairman Les Edwards will host a special Breakfast Forum at 9:30 a.m. on Tue. Nov. 8, 2005 at Grand Hyatt Hotel's Namsan II Room in Seoul. Dr. Kim, who works for Human Resource Consulting, will give a speech under the title of "Managing Your Workforce in Korea." Dr. Kim will discuss current and important employment issues that affect foreign company employees. He will also focus on wage trends for 2006. He will adress his lecture in three sections. The first part will be his explanation Korea's economic index and their product treaties which differ from other countries. The second section will be about national competitiveness, overall human resources issues with a particular focus on leadership and talent. He will round up his speech with a discussion of key labor issues such as Korean Trade Unions and workplace ethics. Foreign businesses should have a particular interest in attending this event. They will learn about the advantages and disadvantages of the workforce in Korea. Registration will start between 7:30 a.m.and 8 a.m. on Nov. 8 with breakfast scheduled at 9:30 a.m. The cost will be 35,000 won (about 35 US dollars) for members and 40,000 won (about 40 US dollars) for nonmembers. Please RSVP no later than 9 a.m. Nov. 7 Monday. Inquiries about Dr. Kim's speech can be made by contacting his office at 7th Floor, KTB Network Bldg. 826-14, Yeoksam-dong, Kangnam-gu, Seoul 135-769, Korea Tel: 3404-8300 Fax: 3404-8333.